Jameson, the world’s No.1 Irish whiskey, is bringing St Patrick’s Day celebrations to life across the world for consumers by hosting Jameson ‘St Patrick’s Live’ events throughout March and on Sunday 17th March. The headline event will be held in Dublin, Ireland and aims to give Jameson fans the ultimate, alternative St Patrick’s experience. Festivities include The Jameson St. Patrick’s Live party in Dublin, which will be headlined this year by globally-acclaimed band, Bombay Bicycle Club, with support from leading Irish musicians, Jape and The Cast of Cheers. The concert will be streamed live on www.jamesonwhiskey.com to allow people all over the world to experience St Patrick’s Day, Jameson-style. Jameson is also taking over streets and venues in major cities such as Prague, Buenos Aires, Mumbai and Stockholm to give locals a taste of true Irish St Patrick’s festivities. This year’s Jameson St Patrick’s Live celebrations sees the return of the annual Jameson Live Global Broadcast, where radio stations from around the world descend on Dublin to join in the festivities and broadcast their shows live from the Old Jameson Distillery in Dublin. 43 radio stations from 10 countries will broadcast and capture the bustling atmosphere of Dublin. Once again, Jameson is supporting its St Patrick’s Day activities with the release of a special limited edition bottle, which will be available to on trade, off trade and travel retail customers. Created by glass artist, David Smith, the 2013 design evokes a classic back bar mirror, in recognition of the iconic glass etching and ornate gilding that can be found in Dublin pubs where Jameson has been served for generations. The limited edition bottle is available in 24 countries around the world from February 2013. Howard Southern, International Marketing Director for Irish Distillers Pernod Ricard said: “As the world’s No. 1 Irish whiskey, we are proud to offer an alternative Dublin St Patrick’s Day experience to consumers around the world. The Jameson Live Global Broadcast and the Jameson St Patrick’s Live party have proven to be very popular and we are confident that this year’s events will encourage even more Jameson fans to join in and embrace their Irish spirit”. The 2012 celebrations saw over 200 hours of broadcasting time at the Jameson Global Live Broadcast, from countries such as the US and Japan. 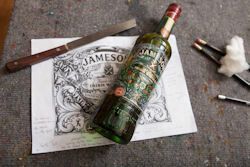 The Jameson website registered more than 25,000 hits on 17th March 2012, as consumers around the world looked for Irish inspiration, while the activities helped the brand surpass the 400,000 Facebook ‘Fans’ milestone.